As we focus on the disaster in Haiti, I thought I'd compile a few books written for children and teens set in that country. Stories can bring faraway people and places from the screen into our homes and hearts, and keep them there, even through information overload or compassion fatigue. As always, feel free to suggest additions in the comments. 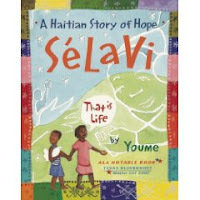 The true story of Sélavi ("that is life"), a small boy who finds himself homeless on the streets of Haiti. He finds other street children who share their food and a place to sleep. Together they proclaim a message of hope through murals and radio programs. After selling oranges in the market, a mother and daughter have enough money to ride the tap-tap, a truck that picks up passengers and lets them off when they bang on the side of the vehicle. Because her family is too poor to be able to buy paints for her, eight-year-old Ti Marie finds her own way to create pictures that make the heart sing. After many futile attempts to plant a tree in honor of his new baby sister, a young boy discovers the perfect solution. Using his tricky ways, Malese takes advantage of his neighbors, until they catch on, after which he manages to pull an even bigger trick on them. A collection of folktales featuring magical human and animal characters, from tricksters and buffoons to dancing dolls and talking fish, by the late Haitian artist and writer Turenne Des Pres (1907-1990). 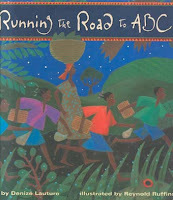 Six children awaken before dawn each morning to run barefoot to school, a journey that is complemented by the sounds of nature and the bright morning sun, in a rhythmic ABC story that captures the nation's hill and meadow regions. Queen Anacaona was the wife of one of her island's rulers, and a composer of songs and poems, making her popular among her people. Haiti was relatively quiet until the Spanish conquistadors discovered the island and began to settle there in 1492. The Spaniards treated the natives very cruelly, and when the natives revolted, the Spanish governor of Haiti ordered the arrests of several native nobles, including Anacaona, who was eventually captured and executed, to the horror of her people. In the hospital after being beaten by Macoutes, seventeen-year-old Djo tells the story of his impoverished life to a young woman who, like him, has been working with the social reformer Father Aristide to fight the repression in Haiti. It's election time in Haiti, and bombs are going off in the capital city of Port-au-Prince. During a visit from her home in rural Haiti, Celiane Espérance and her mother are nearly killed. Looking at her country with new eyes, Celiane gains a fresh resolve to be reunited with her father in Brooklyn, New York. The harsh winter and concrete landscape of her new home are a shock to Celiane, who witnesses her parents' struggle to earn a living, her brother's uneasy adjustment to American society, and her own encounters with learning difficulties and school violence. To get involved in a children's book specific way, consider joining our new Ambassdor Katherine Paterson by supporting the International Board of Books for Young People's Children in Crisis Fund, which has a project in Haiti.